Don’t ignore back pain in Emergency rooms and coronary care units . . . you may have to pay a big price ! Chest pain as a symptom in acute MI is vitally important as it only brings the patient to the ER. (Realise ,silent MIs can never reach the hospital in time ! ). Heart is located few centimeters beneath the chest wall and extend up to 15 cm posteriorly.The location heart within the chest wall , make it a three dimensional structure .Theoretically pain can initiate in one focus and radiate to any direction. Traditionally , when we say chest pain , we mean the anterior chest wall on either side .Technically , chest contains a lateral and a posterior wall .The posterior surface of the chest is called back of chest , or some times simply the back . 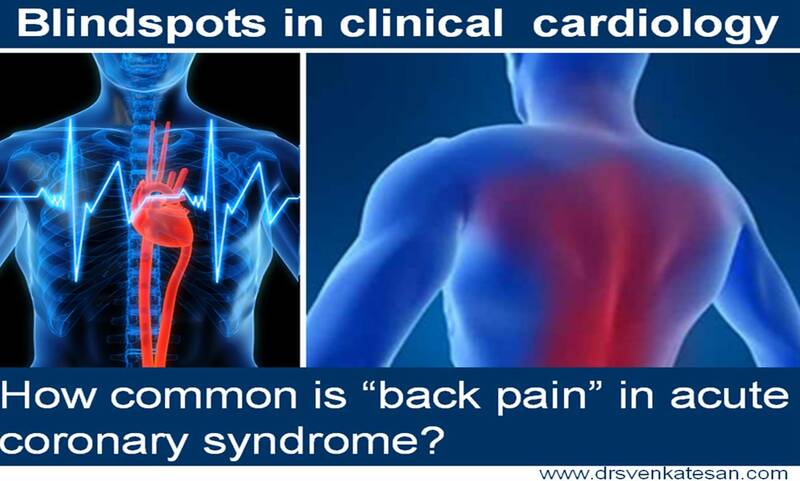 We know , chest pain can radiate to many sites , of course the much hyped (May not be common yet !) being the radiation to left shoulder , and arm. The ischemic chest pain , even though described as classical angina over a century ago . It applies mainly to stable exertional angina .In STEMI or unstable angina these rules are can not be expected to be followed strictly. What is the quantum of pain signals arise from each of these components ? Obviously , myocardial pain should be the dominant one .Here again , there is a dichotomy .Whether the infarct segment elicits more pain or the surrounding ischemic segment is also not clear. The is an important difference the character of pain infarct pain is a severe continuous dull aching .Some believe in a fully infarcted segment where the nerve terminals are dead can not carry pain signals and pain is absent, while partially dead muscle produce maximum pain. The somatic nervous system , that mirrors the visceral pain into the dermatomes that the patient feels as if the pain is originating from these sites. Heart is a huge middle mediastinal structure , primarily reflects the pain to the anterior chest wall , but no surprise if it deflects the pain signals posteriorly also. Of course , the spine and the thick posterior chest muscle walls tend to block this transmission. the following things has been observed. Severe back pain in a patient with large STEMI invariably indicate a myocardial tear . Every cardiologists would have seen atleast few cases of STEMI presenting only as back pain.The problem here is they land up in varied departments .We have on instance of a STEMI landing to a ortho surgeon .He was good enough to suggest an ECG and that showed an extensive infero posterior MI and later shifted to coronary care unit. Does posterior MI more likely to produce back pain or posterior chest pain ? Not proven but distinctly possible. ( posterior MI -Posterior pericarditis- Back pain . )We emphasize posterior chest leads in ECG V7 to V10 in inferoposterior MI . We expect the injury current to flow to the back , is it not logical some of the neural signals would also reach the back. Never underestimate back pain. We are tuned to think chest has only one surface that is anterior .This is a gross missense .After all , there is a huge area(> 30X 30 cm ) of chest wall located behind us . Take an ECG in all patients with acute pain in the back of the chest . Even though this may look a funny advice . . . it is an important clinical tip for all those budding physicians of this world. If one life is saved per 100 innocent back pain cases , this article acheives it’s purpose !